A SLAPPer may be getting SLAPP-backed in Hackensack. This case merits watching in Hoboken. 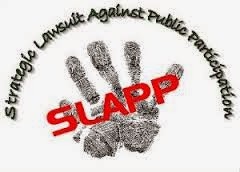 A former Hackensack, N.J., town prosecutor and his lawyer are named as defendants in a so-called “SLAPP-back” suit claiming they chilled a local resident’s free-speech rights with a frivolous defamation claim. Former municipal prosecutor Richard Salkin, attorney Laura Kirsch and her firm, Kirsch & Kirsch, are named as defendants in the suit filed by Steven Gelber. Gelber claims his constitutional rights were violated by a defamation suit filed against him in state court in 2012 by Kirsch on behalf of Salkin. Superior Court Judge Charles Powers Jr. dismissed the defamation claim in June of this year.